2016 Yamaha YZ450F Team Yamaha Blue / White, In stock and ready to ride. 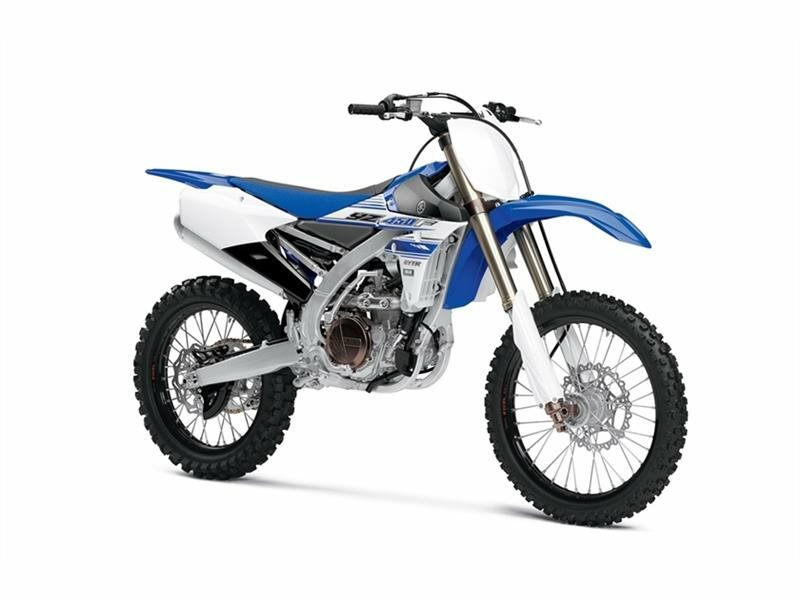 Call us today at 817-695-1600 - Innovative Engine, Updated for More Top-End Power Liquid-cooled, DOHC 4-valve, fuel-injected engine with the same forward-positioned, straight intake, rear-inclined cylinder and rear positioned exhaust layout as the YZ450F  now with further optimized crank balance and even more advanced piston technology between the cases. Advanced Fuel Injection The four-titanium-valve cylinder head is matched to a battery-less fuel injection system that provides optimized power at any rpm. The fuel injection system instantly adjusts the air/fuel mixtures depending on altitude and temperature, for a hesitation-free engine that delivers no matter the conditions. Bilateral Beam Aluminum Frame The aluminum Bilateral Beam frame offers a superb rigidity balance and provides unmatched lightweight handling, with updated suspension settings for smoother damping feel. Wraparound Rear Positioned Exhaust Layout The exhaust pipe has an innovative layout, circling the cylinder, giving the exhaust pipe proper length for an excellent exhaust pulse effect. At the same time, the exhaust pipe has three different diameters throughout the exhaust tract, bringing out excellent power characteristics. This layout allows the silencer to be moved forward, behind the side panel, making it closer to the middle of the bike for centralized mass for superior handling. Mass-Centralized Ergonomics The layout of the seat, fuel tank, air box, and wrap-around exhaust system moves the bikes mass towards the center for exceptional handling. The front intake layout with large air filter element adds the benefit of reduced air filter maintenance due to its positioning away from dirt roost from the rear wheel. New 270mm Front Brake Beefy 270mm front disc brake coupled with new pad material offers outstanding braking power and performance, with exceptional controllability. GYTR Power Tuner Ready Accessory GYTR Power Tuner lets owners adjust air/fuel mixture and ignition timing maps to match engine performance characteristics to the rider and track conditions in a matter of seconds with the push of a few buttons, as well as monitor engine diagnostic codes. MULTI MOTO SHOOTOUT WINNER. Bike of choice for Justin Barcia and Weston Peick and top pick of the top moto magazines makes the YZ450F a double winner. And the YZ450F is even better in 2016. All Yamaha pictures are kind of Yamaha HD motorcycles picture was taken, including motor fuel gauge, engine, engine mounts, tires, fuel tank, the car handles, lights and so on, 2016 Yamaha YZ450F Team Yamaha Blue / White full-screen viewing,2016 Yamaha Motorcycles today Price: $8,590 .